Internet access is rapidly being considered a utility when it comes to business. It’s especially important when it comes to emerging markets, enabling local businesses to compete against the big budgets of international organisations. But with Internet bandwidth demand increasing at a rate of 40% a year, network providers are going to be fighting a losing battle unless they invest in new technologies to boost bandwidth and keep on top of demand. This is something that the Government of Tenerife is already investing in with ALiX. ALiX is a project set up to improve the competitiveness of the island in the ICT market, which includes terrestrial dark fiber, the subsea cable, Canalink. A joint venture between IT3 -a public operator owned by Tenerife’s Government- and Islalink, the high capacity network, links the islands with the rest of Europe, Africa and South America. Tenerife houses D-ALiX a neutral data centre and submarine cable landing station. This forms a reliable point of contact for Gran Canaria, the Astrophysical Observatory of the Island of La Palma and the European research network GEANT-2, and Western Africa. This connectivity hub is central to ALiX. But forming this kind of hub brings its own challenges. As the Canary Islands takes on this role, neighbouring regions, Africa in particular, look to it to provide a strong Internet connection with a high capacity to manage this level of traffic. With nearly 12 million visitors a year, the Canary Islands supports a strong tourist industry and local businesses need high bandwidth Internet access to manage international bookings and customer service. Africa largely relies on international banking and both local and national businesses contributing to its growing economy will require reliable Internet access. This subsea cable supports the increasing Internet traffic in these regions, so local businesses can grow unhindered by location. But what about future growth? Laying new cables to accommodate more bandwidth is certainly a big undertaking but by investing in new fiber optic technologies, Canalink has been able to dramatically increase bandwidth without investing in more fiber. As with any emerging market, capital is at a premium, so increasing capacity whilst lowering capital and operational costs is essential. One such technology which is making a big impact is photonic integration. Last year Canalink implemented a digital optical networking system from Infinera, powered by photonic integrated circuits, to dramatically increase bandwidth capacity. Photonic integrated circuits are pairs of small chips, situated at each end of the network. Each chip combines and miniaturises hundreds of optical components so that once the wavelengths pass through; they are split into different channels, amplifying bandwidth up to ten-fold. This means that network providers can carry up to 500 gigabits of Internet traffic on a chip no bigger than fingernail. Regional businesses can now benefits from the Internet injection they need to compete in the global market. 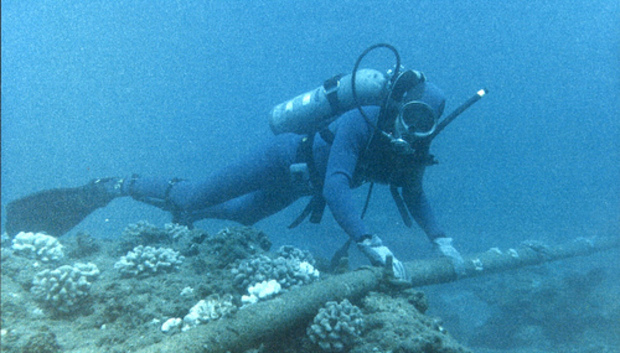 Strong, reliable internet access provided by subsea cables will result in a boom in business, healthcare and education as developing regions have access to online tools. « Dan Swinhoe (Asia)- Gadget Loving Japan- Sent Via Fax or Smartphone?